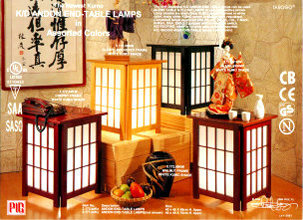 I'd been planning to build a floor lamp using bamboo for the pole, and a lampshade that was kind of inspired by shoji screens (I'm trying to get a Japanese-style decor going), I like that look of light through translucent paper. By the time I'd built the base and the pole, and then the lampshade, I realised the shade was too big and would have made the lamp look top-heavy. Then I applied a very thin layer of wood glue along one side of the chopsticks and stuck them to the paper, lining up the outside edge of the chopstick with the outside edge of the paper. You can see how I laid them out in the photo. (Sorry, I didn't think of taking photos while I was making the panels, but I think the photo of one side of the completed shade gives a good idea.) Weigh it all down with some books or something and let the glue dry. You'll want to make 4 of these panels. If necessary you can trim the paper by cutting along the back side of the chopstick with a sharp knife and peeling off the extra. I was originally going to buy lamp sockets for the bulbs, but when I Googled to see whether it was better to wire them in parallel or in series, I came across this page - funny the number of webpages with detailed discussion of CFLs that are about using them to grow weed :) - which shows how to open up a CFL to wire directly to the bulb (see halfway down that page). This means you can avoid using lamp sockets, which was good because I was trying to keep the price down, and also makes the bulbs shorter, so they sit closer to the base and don't risk sticking out the top of the shade. I tried pulling the metal base off with locking pliers as suggested, but couldn't get it to budge - and while I was trying I dropped the bulb and cracked it. Stuck the bulb in a lamp socket to see if it worked but it was dead - well, at least it gave me a practice bulb before trying the others. I actually found it was easier to use a hacksaw to cut through the bulb screw-thread, then once I'd cut the bottom off, I crushed the bottom with the pliers to break the glass (I guess that's what it is) to get the wire out - safety goggles probably a good idea ;) In fact it would be safer to just snip the wire as low down as you can, especially since I'm just assuming the glass stuff is non-toxic! Though I guess it would have to either be glass or at least some inert resin, because it's the insulator between the live and neutral. btw, you do want to be careful if you break the bulb of a CFL because they contain mercury. I hunted around for some way to fix the bulbs to the base, and found some left-over bamboo from making the pole for my floor lamp. I cut a few short lengths, split them into halves lengthwise, then for each bulb I wood-glued 4 of these pieces to the base to make a sort of cup to sit the bulb in, using rubber bands to hold the pieces tight against the bulb to keep the right shape while the glue dried. From what I've seen online, it seems it's better to wire bulbs in parallel than in series. I had to extend the wires from the bulbs so I could wire them in parallel to the mains cable. For these wires I soldered the connections and used heat-shrink tubing, but decided to use a terminal block to connect these wires to the mains cable, to make it a little easier to change bulbs if I need to in the future. I hot-glued the terminal block to the base for strain relief so the mains cable doesn't pull directly on the soldered joints. Once it's all wired up and all the connections are insulated, fit a plug and plug it in! You could fit a switch but I decided not to bother. Of course this is mains electricity (so standard safety rules and disclaimers apply etc. etc.) but I think it should be fairly safe - the lamp itself is wood, and there is no metal anywhere that it's possible to touch: in some ways it's safer than a socket. I haven't found that the CFLs get too hot for the bamboo holders either, especially since they don't hold them too tightly. Not using sockets does make it harder to replace the bulbs when they fail, but CFLs last for years, I can see the paper getting torn before the bulbs are dead... Replacing them would only mean hacking new bulbs and wiring them in, though, but using proper sockets would be a better permanent solution! My 1st instructable btw so hope you like it - comments welcome, especially because as soon as I put it on the speaker I knew I should make a matching lamp for the other.. so it'd be good to hear any suggestions for improvements before I start on it! isn't tracing paper highly flamable? getting really hot and smelling smoky lol. Instead of CFL bulbs (which contain a small amount of mercury, and no amount is a safe level, AND they require proper safe disposal! ), I have used bright white L.E.D. xmas lights, rolled into a wad and placed inside. They never get hot, are incredibly bright, and if you want a warmer glow, just change the paper in the lamp to a warmer color. It works great and is super cheap (especially around xmas time when all the lights go on sale. It like it, thank you !!! I think you have a lot of work on your hands when it is time to replace the bulb. It might have been better to have used 2 lamp holders instead? I love it, planning on making one. Great instructions. That has definately given me a better visual understanding of the process. I've had trouble lately making shades for lamps, and you've definately lit a few bulbs in my mind!